JPG is thrilled to announce that we’ve won 4 big wedding photography awards in the latest WPJA and ISPWP contests. We wanted to take a minute to tell you about the photos that helped us win big and to say that we can’t thank you enough for trusting us to document you and your special moments in 2015. 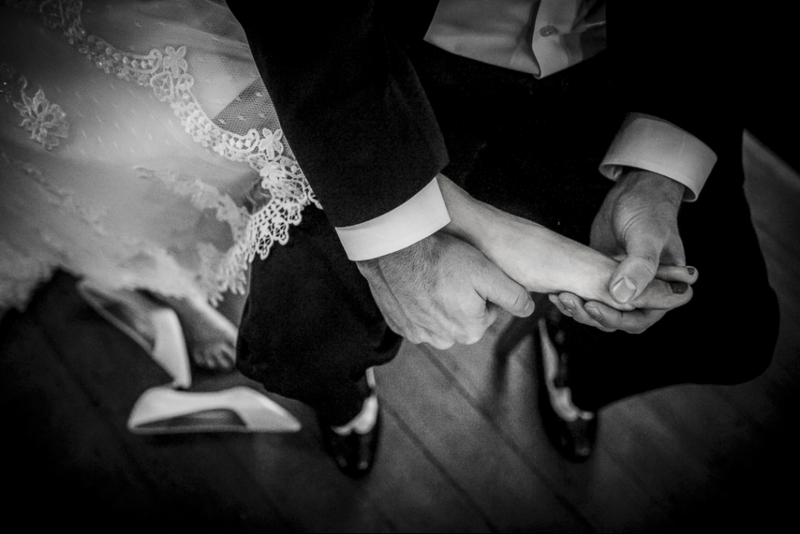 We are excited to able to feature this award winning wedding photography on our blog. Back in August, we shot Jennifer and Jonathan’s wedding at the incredible Cescaphe Ballroom. On our way to the reception, Jennifer saw a Wendy’s in the distance quietly said, “Boy I could really go for a JBC right now.” “You want a Junior Bacon Cheeseburger? Well let’s get you one!”, I said. At Wendy’s, I came up with the idea of snapping some photos of the couple eating fries. 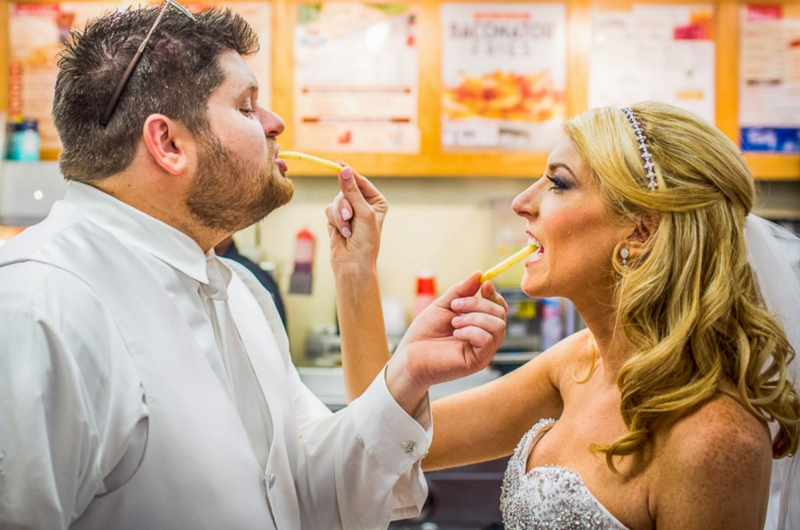 They were a bit hesitant at first, but they ended up letting me do my thing and the quirky photo of the couple eating some fries took 15th place in the Wedding Photojournalist Association’s Taste category for 2015. The International Society of Professional Wedding Photographers awarded a photo I took of Sheila and Joe’s Powel House wedding 4th place in their Family Love category. It’s a tender moment of Joe rubbing Sheila’s feet taken last during a snowy afternoon last march. 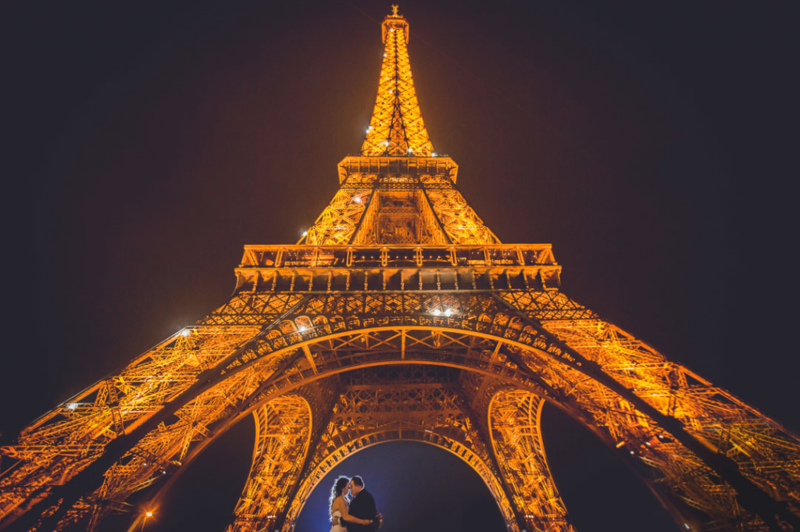 ISPWP also awarded our now hugely famous “Naked Biker” photo (a photo of some naked bikers riding around in the background of Blaire and Ross’s wedding that went viral) 13th place in their Humor category, and they awarded the photo I took of Devon and Keeyan under the Eiffel Tower last November 14th place in their Wedding Venue/Location Category. My wife Rebecca and I flew all the way to Paris for their wedding, and we were their official witnesses. I just wanted say congratulations to all the other winners, and a huge thank you for all your continued support. This award-winning photography not only put JPG back on the top of the rankings for ISPWP and WPJA in Philadelphia and Pennsylvania, but they’re also a huge honor for me and for everyone else here at the studio.It’s great to see our non-traditional style get some recognition. Thank you!! !